Learn more about the "You Don't Know What You Don't Know" campaign here. Download a printable PDF of this poster. 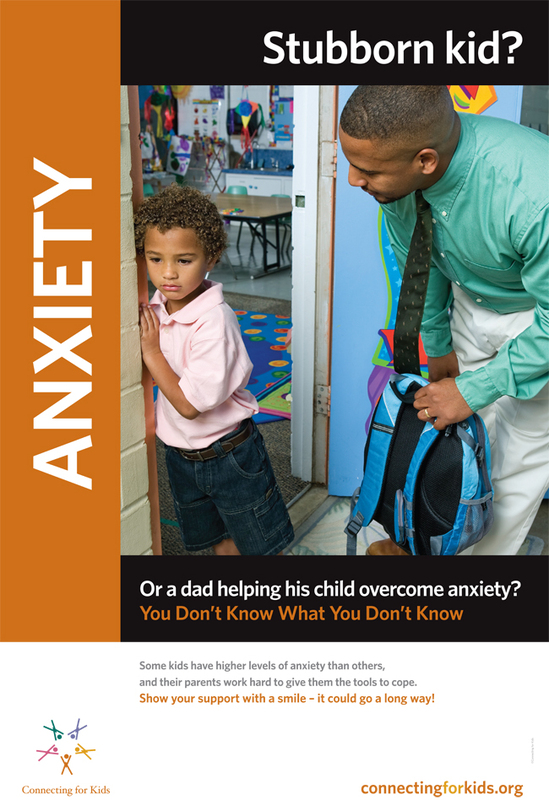 The poster shows an image of a child lingering at the door while the child's father tries to coax the child into the classroom. The text above and below the image reads "Stubborn kid? Or a dad helping his child overcome anxiety? You don't know what you don't know." Immediately below the main image and text is a short passage explaining the poster. It reads: "Some kids have higher levels of anxiety than others, and their parents work hard to give them the tools to cope. Show your support with a smile - it could go a long way!"